There are some bamboo that do flower yearly but on the whole the gregarious bamboo flowering is sporadic and it’s said it can take place any time from 30 years and up to 120 year intervals. It’s a long time to wait and have the chance to witness this rare occurrence personally! The bamboo flower usually looks like grass flowers with variety in appearance between species. 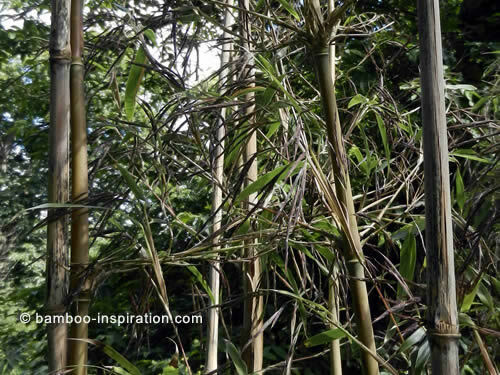 As far as I can ascertain, it is still a mystery as to why bamboos exhibit unpredictable and gregarious flowering, along with it being an extremely hard topic to research due to the long lengths of time between flowerings of different species. It seems that bamboo from the same clone will all flower at the same time, at different ages, in different climates, wild or cultivated, and wherever their geographic location is across the world. Is that a strange phenomenon or what? There is usually a long cycle between flowerings that seems to have a different time trigger dependent on species. Nobody knows what triggers it, and in some species there has never been a known flowering period! So you can see that it is impossible to know if your bamboo will ever flower or not… and if it will survive the flowering if it does happen in your lifetime. Although it is hard to determine the exact cause, the parent plants may then simply die, either in whole or in part, but not always. Some species flower regularly and either don’t show any detrimental signs to their health, or they get weakened but regenerate over a few years. If you buy species that have already been known to flower and produce seed, you can pretty much be sure they are unlikely to flower in your lifetime, and therefore are unlikely to die from it. 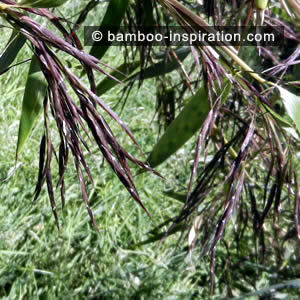 The image below shows a flowering bamboo with a mixture of live, dead, and dying culms in the clump. 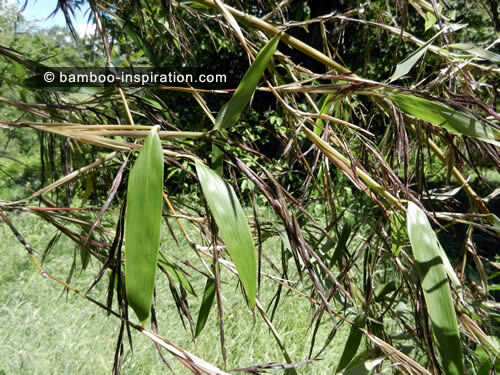 The seeds are not yet formed and from the unhealthy appearance of the bamboo it looks like it may die altogether once the bamboo flower process has completed. When a whole species of bamboo produces flowers and then completely dies in countries where people depend on these plants for their daily lives, including food, buildings, crafts, and exports, the result is absolute devastation! It is said that flowering is sometimes followed by a huge growth in the population of rats who then also eat their way through crops in the region; this in turn has catastrophic consequences for the population of humans and leads to things such as famine.